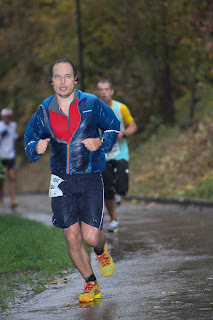 Last Sunday was the Ticino half marathon, and a cold and rainy half marathon it was. If I wanted to be really blunt, I would say that the weather was shite. However, as I am softly spoken (cough cough), I will say that the weather was "not ideal". It was like running through one big puddle. Whatever you did, whatever you wore, you were going to get soaked, either from the rain (outside in) or if you wore waterproof clothes from the sweat (inside out), regardless of how breathable they claimed to be. It was a race after all, so you were bound to sweat like a beast. I went into the race with a previous half marathon PB of just over 1 hour 35 minutes. This time though, my training has been significantly more structured and consistent (despite a much lower average weekly mileage), so I had higher expectations for myself. My absolutely best possible time would have been 4 minutes per km average, so just over 84 minutes. In training I have not been able to keep up that pace for such long distances, so I knew that in reality it was a long shot. However, there is always the extra adrenalin factor in a race, which helps to spur one on. Realistically though, I was expecting to finish the race in around 90 minutes. In terms of kit choice, I opted to wear my Montane Quantum GL Slipstream Jacket throughout the race to at least keep some of the rain and wind off me. This is the same jacket that I wore in the Marathon des Sables during the hailstorm on the long stage, saving me from a severe case of hypothermia, and it weighs in at an impressively light 65g (in size medium). The electric blue colour is also pretty funky. On the bottom half I opted to wear the Nike DriFit shorts that I also wore in the MDS, so that at least when they got rain soaked they would not be super heavy. Then on my feet I wore my Newton Distancia racing flats, that I have also been using in all my training runs. Recall that I am a minimalist runner now, and don't go in for all that cushioning malarky. Again, the advantage with them being light shoes was that even rain soaked they would not be overly heavy. I started in the first group based on my estimated finish time, and we started at 9.15am along with the full marathon runners. The others (Anny and my 2 colleagues Derek and Mehdi who also did the half marathon) started in group D at 9.45am. There were not so many runners in my start group and there was no need to jostle for position. I was wearing an MP3 player headset throughout the race, full of carefully selected motivational songs such as Lose Yourself by Eminem, Good Feeling by Flo Rida, Stronger (What Doesn't Kill You) by Kelly Clarkson and some others that some people might call outdated but which for me will always inspire me such as Eye of the Tiger by Survivor. 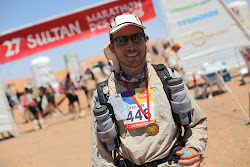 I also included Highway to Hell by AC/DC, as this was the song that they always used to play at the start of the MDS stages, so it brings back fond memories, as well as memories of just how tough I can be when needed. As the countdown started, I switched on my MP3 player, got into "the zone" and then I was all ready for the off. I sometimes have a habit of going off too fast in races at the start, and paying the price for it later, so I was determined to go off more steadily this time. It seems my best intentions were thwarted, as looking at my Garmin stats I ran the first km in well under 4 minutes, and my heart rate went up to around 180bpm (my max is around 188bpm). After that though it seems I paced myself well, as my heart rate stayed steady at around 165bpm. For the first few kilometres I was trying to run around the puddles in order to keep my shoes dry, but I soon gave that up, as it would have resulted in me running an extra few kilometres on top of the 21.1km. So I ran straight through the next puddle I saw and continued ploughing through every one thereafter. I felt pretty strong throughout the race, but I was not expecting the hill that came in the second half. It was not a huge hill, but 35m of elevation gain is certainly noticeable when you are already somewhere near your limits. I did the Ticino half marathon several years ago, and it followed the same course back then too, but somehow I forgot about that hill between then and now. Once the hill was over, followed by the short downhill, I knew it was pancake flat all the way along the lake to the finish and I switched on my cruise control. My final time was 1 hour 30 minutes and 17 seconds, so pretty much spot on what I had predicted. Based off that time, I would be looking at a 3 hour 10 marathon in Pisa, so it is not quite what I aiming for, but Sunday was a new half marathon PB all the same. Derek and Medhi also got half marathon PBs. They completed the Greifensee half marathon a few months back and this was their second half marathon race. Anny also completed her first half marathon successfully. So congratulations to all three of them. All three have been running for less than 1 year, so it is quite a feat that they are now running half marathons. Two days on I am now back into my marathon training regime. Today, as per my plan, I did a short recovery run at lunchtime and a CrossFit session after work. Tomorrow is the end of another Hillseeker running series, and so time to redo the 400m benchmark test that we did at the start of the series. I have to break 61 seconds if I am to improve on my previous 400m time. We will see whether I can achieve that, or whether my body is still recuperating from Sunday's race. I have a gut feeling though that if the conditions are right I may be able to do 60 seconds or under tomorrow night. After that I wouldn't be able to continue with the rest of the session though. With all that talk of exercise I need to go and rest now. On a separate note I am very happy with my SKINS recovery clothing, and after going to sleep in my RY400s on Sunday night, I woke up on Monday morning not feeling as though I had run a half marathon the day before. So they seem to do their job! Excellent work to get a PB in such horrible conditions. You can have a good chill out now! Thanks Caroline. No rest for the wicked though! My marathon is only 4 weeks away, so I had to jump right back in. The half was just to get an idea of what time I can expect in the full.